Hello! How are you? I am home from my “spring break” and life is back to normal! While we were away … a few items in the fridge reached their expiration date … shhh, don’t tell Son #3 … he gets a little worried if the date has passed. 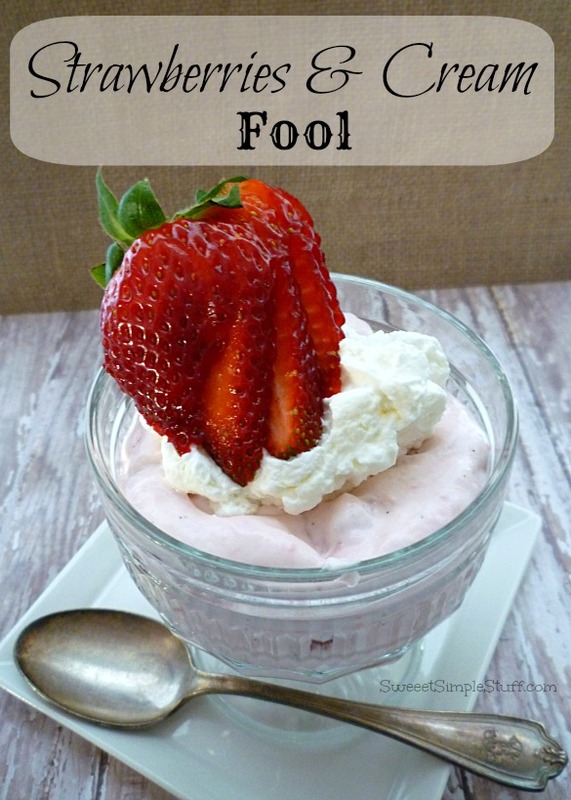 I confess … a pint of heavy cream was about two days past it’s date, but it was fine (I tested it) … could not let it go to waste … dessert was waiting … Strawberries and Cream Fool! 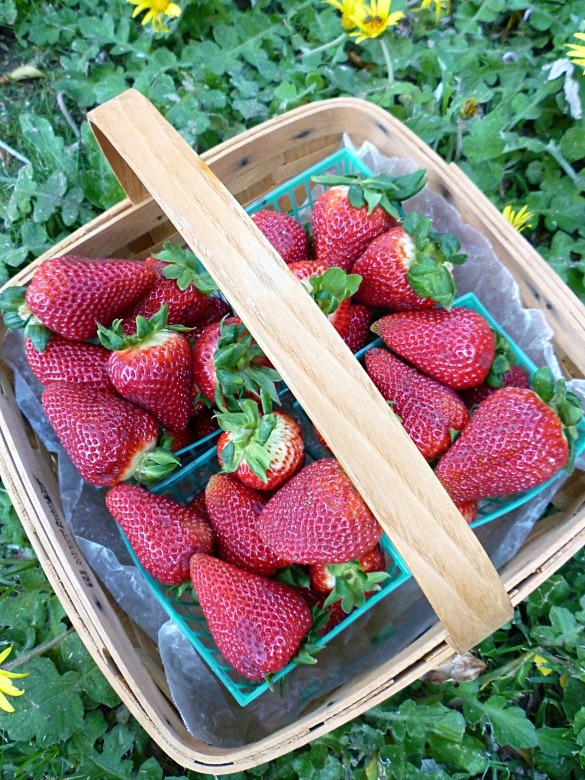 My nice sister-in-law went to the strawberry farm and brought these to me …. She actually gave me six baskets of berries … two mysteriously disappeared before their photo shoot 😉 These strawberries are not only beautiful, they tasted wonderful … oh, how I love spring and summer fruit! 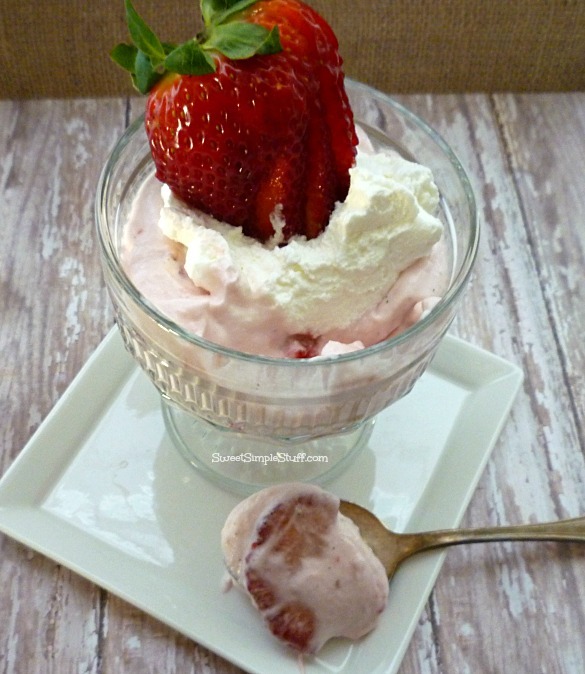 Creamy and cold desserts containing fruit, especially berries, are some of our favorites! I’m sure you will like this one too! Oh, I almost forgot to tell you … I threw in some light (1/3 less fat, neufchatel) cream cheese, just to add a little extra creaminess! Place a medium-sized bowl and mixer beaters in the fridge for 15 minutes. Remove from fridge, add heavy cream and 1/4 cup sugar, beat until thickened and stiff peaks form. In a large bowl, use a mixer to beat cream cheese, 1/2 cup sugar and vanilla until well soft and creamy. Add strawberries and mix for a few minutes, this will help some strawberry juice combine with the cream cheese and create a pretty pink color. Reserve one cup of prepared whipped cream for garnish. Fold remaining whipped cream into cream cheese/strawberry mixture. Put mixture into individual serving dishes if desired. Place in the fridge for 2-4 hours. Garnish with remaining whipped cream and whole strawberries. 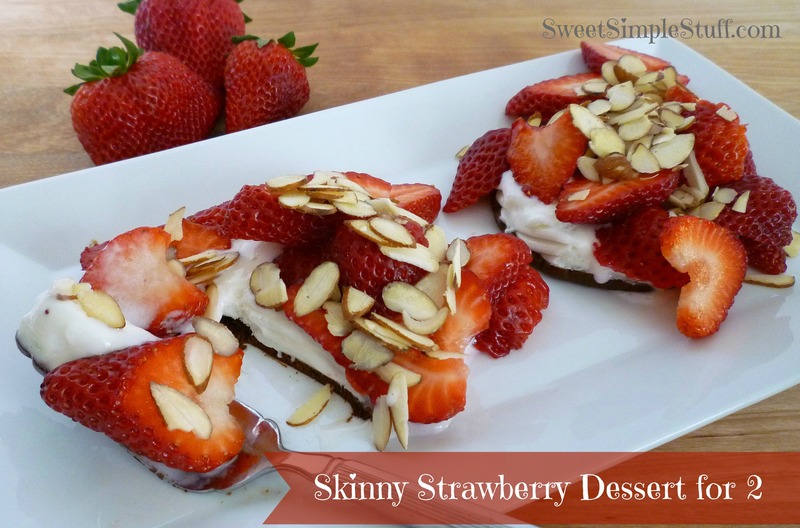 Hint: Fan cut the strawberries … if you want to be all fancy dancy! Do you go berry pickin’? I ♥ your comments! I can’t believe there was anything left in your frig when you arrived home, Brenda. Your boys fell down on the job! I picked raspberries last year at an apple farm about 30 minutes away. However, it was a poor year for raspberries in our area of NYS. Hi Kathleen! The boys probably didn’t know what to do with the cream, LOL 🙂 We grow blackberries in our yard … maybe raspberries next year! This looks really inviting and yummy. Thanks Ellen 🙂 It’s really creamy … kind of reminds me of whipped cheesecake! Hi Carolyn 🙂 Someone else picking the berries would be a faster option too! My daughter buys our Strawberry at the Gro.store as we don’t know where there would be a Strawberry farm is here in Tulsa, Your Recipe looks awesome. Thank you Anna 😉 The grocery store works for me, that’s where mine usually come from! Having grown up in Wisconsin we had an abundance of strawberries. Now that we live in Utah, it’s cheaper to buy them. My rhubarb is ripe and we’re now eating our two favorite desserts ( also on my blog) that are Strawberry & Rhubarb torte and crisp. This looks so good! Can I use coconut cream instead of the heavy cream in this recipe? Thank you for the link! I’m making the dessert this weekend for Sunday Brunch, so I’ll let you know how it turns out. Fingers crossed! The dessert was a hit! I didn’t add sugar to the coconut cream because it’s naturally a little sweet, but I did add some vanilla extract. The cream beat up a lot easier than traditional whipped cream, and it remained thick and stiff even in the hot weather. The only other major changes I made to the recipe were using a dairy-free Neufchâtel and adding a splash of kirsch to the strawberries. The dessert was great and everyone wanted seconds! Thanks for sharing this recipe! I am so happy that you had such great success 🙂 My friend is avoiding dairy and she will appreciate this info and you have made me want to try it too!